Prime Minister Benjamin Netanyahu has urged UN members to "come to their senses" and reject the Goldstone report into Israel's military conduct in Gaza. 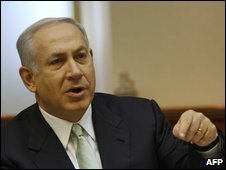 He said UN endorsement of the strong criticism of Israel would deal "a fatal blow" to peace efforts. The Human Rights Council is nearing a vote on the report which accuses Israel and Hamas militants of war crimes. Report author Richard Goldstone said a "culture of impunity" for war criminals wrecked hopes for peace in the region. In remarks broadcast before a cabinet meeting, Mr Netanyahu said the Goldstone report would "deal a fatal blow to three major issues". Firstly, he said, it would legitimise "terrorists who hide behind civilians" by laying the blame on victims of terror who act in self-defence. He also said UN prestige would be adversely affected and the body would become irrelevant like "the darkest days where absurd decisions were passed". "The most pressing issue," he said, "[was that] promoting the conclusions of the Goldstone report will devastate the peace process." "Israel will not be able to take further measures, and will forbear taking further risks for the sake of peace, if Israel is denied its right for self-defence," he said. The 574-page UN Human Rights Council report was written by a four-judge commission led by South African judge Richard Goldstone. It accused both the Israeli army and Palestinian militants of deliberately terrorising and killing civilians on the other side. It urged the UN Security Council to refer allegations to the International Criminal Court (ICC) if either side failed to investigate and prosecute suspects. The report has been widely praised by human rights groups, but Israeli allies like the US have criticised its conclusions. Mr Goldstone has rejected Israeli protestations that it was Hamas which put Gazans in harm's way during the three-week bombardment in December and January. "Israel has said that given the density of the population in Gaza - they did the best they could to avoid civilians," he said in an interview with the US network CNN. "We certainly looked for proof (that Hamas put their weapons near civilians) but didn't find it." He added that some of the killing... "was certainly intentional. There was no mistake in bombing factories". 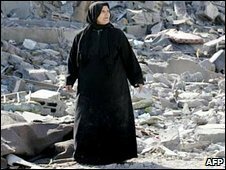 Israeli military action destroyed thousands of homes, hundreds of factories and 80 official buildings. Palestinians and human rights groups say more than 1,400 people were killed in the violence between 27 December and 16 January, more than half of them civilians. Israel puts the figure at 1,166, with fewer than 300 civilians. Three Israeli civilians and 10 Israeli soldiers were also killed.